Commerce has always been defined as the interchange of goods and services for money. It still is, but the way commerce is conducted is in the middle of sweeping change. Merchants that anticipate these changes and prepare for them will win; others will struggle to survive. Cash was invented in the 7th century and since then, broadly speaking, it has been the most common way to pay for the transfer of goods and services. Market places and shops have always been useful as central points to find products we need. Shopkeepers have always played an important part in choosing the right transaction, providing valuable information about products and services and facilitating choice. Over the last decade however these transaction stalwarts are being challenged because the retail payment process is undergoing a transformation. As electronic payments get easier, is there a need for coins and notes? As the Internet gives the corner shop a global footprint, how will retailers respond to and support their new customers? And, logistics and supply chain issues aside, which payment options will ensure secure and efficient transactions? Starting with the cash debate. It’s true that developed countries are becoming ever less dependent on cash, as debit and credit cards, “virtual wallets” and other substitutes grow in popularity. In developing countries cash and bartering has been the prominent method of exchange particularly as the vast majority of people are unbanked. This however is changing; in Kenya, for example, over 80% of adults have a mobile money account. Although electronic and mobile money systems are generally safe and effective methods of payment it is not all straight forward. Success of these systems depends on creating incremental value for consumers and merchants and changing behaviour. This is the reason that while there has been significant progress, 85% of global payment transactions are still made with cash. So what is the future of cash? What electronic payment forms are likely to be successful in the future? If we really are heading for a cashless world then what would this mean for retailers? It’s no surprise that, given the avalanche of technological innovation, retailers have had to extend the ways they accept payments, thinking of different ways to meet customer demand. There are myriad ways in which customers can now pay for their goods like e-shopping with a smartphone, laptop, tablet and even in store. “Omnichannel” is the current buzz word and is a multichannel approach to sales. A key element of it is a consistent and integrated shopping experience across different channels such as a desktop or mobile device, by telephone or in a bricks and mortar store. Many brick-and-mortar retailers around the world including the likes of Walmart, Tesco, Target, and Best Buy have built an ecommerce presence to adapt to the new environment but perhaps more interestingly, even ecommerce giants like Amazon are now planning physical stores. So is omnichannel just a buzz word? How important is the consistent shopping experience across channels? What is the future of physical stores? Can bricks keep pace with clicks or is it in fact the other way around? These omni-channel options mean that retailers have to work hard to complete a sale. Online or off line the challenge is the same, to provide a personal service but on a global scale; as the economist puts it despite a global market place retailers have to provide each customer with “a single salesman with an unfailing memory and an uncanny intuition about their preferences”. Few would argue that the judicial use of big data will help but although there is a lot of talk about its efficacy most of the opportunities big data can offer have yet to be fully exploited. The reality is that there are different chunks of data that are collected, stored and managed in multiple ways. On top of this much is still locked away, stuck on legacy systems that will take years to unpick. Access to relevant information let along the crunching of it will take some doing. Big retailers like Walmart, Tesco, Target, and Best Buy are better positioned to leverage big data to tap the omnichannel trend. But what can smaller bricks and mortar stores do? The point of interaction (POI), the moment where customers and merchants interact to complete the transaction has undergone significant change over the last decade and indications are that this will continue. There are multiple ways to pay and we can expect the “can’t find my wallet” excuse to be a thing of the past as we increasingly grow used to mobile payments. Global standards such as EMV have added additional security, and many now think nothing of buying their coffee’s with a mobile phone thanks to innovations in Near Field Communication (NFC). Recently Apple Pay is looking to redefine the process again using biometrics and card tokenization. Holding a phone however is likely to remain just one of several widely accepted ways to pay but how the multiple options will combine to ensure a safe and convenient transaction method at the POI is a question that both merchants and customers are grappling with. For retailers an age-old concern continues to niggle. How can they offer value-add to their customers? In a world of unprecedented information access customers are now better equipped to dictate what they want, what price they want to pay, when they want it, where they want it and from whom they want it. The buying process is no longer linear but ducks and dives from tablets to in-store to mobile via friends’ recommendations to the opinions of strangers then back to the computer again. Retailers, striving to maintain an ongoing relationship with their customers, are faced with multiple ways to communicate and engage and can gather data from many sources. Those who manage to connect to their customers can build a more detailed picture of who they are selling to than ever before. The challenge for retailers is, in a world where social media drives commerce, how to build and retain loyalty and trust with their customers. All the evidence suggests that the use of cash is in decline across the globe. The World Bank reports that there were 83 cash dispensers for every 100,000 adults in the US in 2008 but by 2012 there were only 68. The Federal Reserve Bank of San Francisco has also published a report showing that in America, the share of transactions using cash has fallen; between 1993 to 2013, although the American economy grew in real (inflation-adjusted) terms by 65%, notes of $50 or lower grew by just 19%. In comparison to this share of debit and credit card payments increased by 20% in US in the 5 years starting 2006 based on analysis by MasterCard analysis. There are several reasons for this. First, Cash takes time to get at, is riskier to carry, and by most estimates, cash costs society as much as 1.5% of GDP. Second, merchants make fewer profits using cash. In fact when benefits of electronic payments such as driving greater customer satisfaction and loyalty for merchants over cash are considered, MasterCard’s research shows merchants can make $40K more in profits for $1MM in sales. Third, Cash by comparison can be a hindrance to financial inclusion. Indeed in a recent study MasterCard found that electronic payments are an effective entry point for financial inclusion. With governments, international development agencies, academics and the private sector, making financial inclusion a priority on the agenda, it is likely we will see a significant portion of the 2.5 billion currently unbanked adults armed with electronic payments products in the future. Over the next decade cash quite possibly will lose out to technology. And electronic payments are not confined to the developed world; in Kenya over 80% of adults—use a mobile-phone payment service called M-PESA that can also cater to business customers too. Turning to the real world of bricks and mortar retail. Retailers are finding it tough to keep up with their more nimble online counterparts. First they have to contend with the costs of floor space but they also have to acknowledge that their customers have more choices and are more informed that they have ever been before. How to manage cross border commerce is a big challenge. Our research shows that since 2009, international visitor arrivals and spending have grown faster than real global GDP. It also forecasts that cross-border visitors to the 10 leading destination cities will spend $136 billion during 2014. Even a 1 percent share of a leading market such as New York or London is near $200 million in annual revenue. Despite its size and strong growth, cross-border commerce is a challenging area. When international travellers arrive, merchants sometimes have difficulty recognizing them, anticipating their needs and catering to them. Even worse, most merchants neither recognize the size of the cross-border opportunity nor understand their current share. Cross border spending is not a trivial issue and the challenge for the next decade is to build wider understanding of the opportunity and create ways in which retailers can better understand customers from abroad. It is clear that omnichannel commerce is here to stay. MasterCard’s SpendingPulse report is showing that U.S. ecommerce is growing at double digits year-over-year as compared to total retail sales (ex-auto), which are growing in single digits. While stores may be becoming less important, they are not dead and are an integral part of the purchasing process; close to 20 billion people visited US malls in Nov and Dec in 2013. 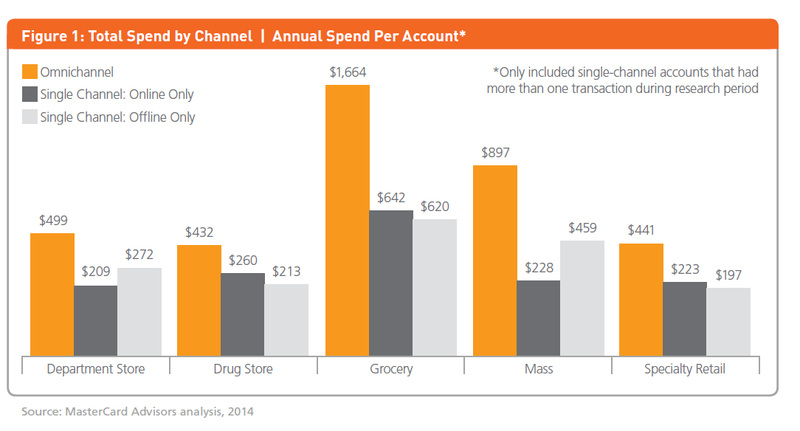 Providing a consistent experience across channels will be critical; our research shows that spend by omnichannel customers, those who shops across more than one channel and value a consistent experience, is significantly higher than single-channel customers, those who shop via one channel across all verticals (Figure 1). Of course e-commerce is continually evolving but the biggest change may well happen in store. First stores will likely become smarter. Retailers currently don’t know who walks in the door so its difficult for them to provide a customized experience and individual offers. Beacon technology can solve this issue for stores. With a larger range than NFC this technology has enormous potential for customers and retailers alike. Widespread adoption of Beacon technology by stores and customers will make it quicker and easier for customers to access the information and products they are looking for, and for retailers to provide special offers or discounts to loyal shoppers. It may also provide retailers with invaluable insights about their customers’ shopping habits allowing them to make improvements to the store layout by identifying store flow, maintaining service standards and operations that will benefit everyone. In ten years you may be able to expect to walk past a shop and your mobile will receive meaningful and personal notifications on discounts or deals that you are likely to buy based on your shopping preferences. If you go inside you may be able to use your phone to pay with offers automatically applied. There may be other improvements. For example, checkout lines will likely become things of the past. By using mobile technology instead of a fixed till, customers will likely enjoy a much more personal experience. Pioneers in this include Apple, J C Penny and Nordstrom in the US but it will likely become a common phenomenon. Similarly, “order ahead” capabilities that allow customers to order and pay from their mobile phones before they even enter the store and generally speed up the sales process will likely become widespread. Expect the food service industry to lead the way. The second area of change will likely be in the way customers choose and buy goods. It will likely be all about choice. You may be able to order online and pick up at the store, order at store and deliver online, get similar offers across channels and yet have the same payment options. The transformation between the virtual and the actual has already begun; in South Korea, Tesco has built virtual grocery stores on subway platforms that have a similar layout to actual stores. Customers can now do their grocery shopping during their daily commute using their mobile phones, pay online and have them delivered when they get home. Of course there are big variances in this depending on internet access and payments solutions like PayPal and Apple Pay are trying to provide a similar payment experience in other markets. Looking at POI, Uber, which is in 40 countries, is a great example that is revolutionizing the way we think by actually embedding payments in the process and focusing on the customer experience. Another good example is PayByPhone that is revolutionizing paying for parking by focusing on the whole customer experience. No more grappling for coins or making trips to replenish the meter. PayByPhone lets you pay remotely from your mobile phone – even when you have left the car park and are on the train. Look out for additional value added services like Bill pay and remittances that not only enhance the customer experience but also drive incremental revenue for retailers. The key for retailers is to consider ways that digital payments can be used to enhance customer experience. We expect many more digital payments applications in areas where cash currently dominates. Vending machines are another example. All of this is of course driven by the supposition that in the next ten years there will likely be a global acceptance of electronic payment products. We are nearly there; Square and iZettle’s mobile point-of-sale (mPos) solutions are demonstrating this by giving the small merchants who are the main driver of cash transactions the ability to accept electronic payments at affordable rates. Such is their success in fact, it is expected that by 2019 46% of POS terminals will be mPOS. For the payment providers innovative ways of determining merchant credit risk, for example by using alternative data sources such as cell phone usage and bill payment receipts, are critical to open the way for unbanked merchants, particularly those in developing economies where the majority may not have access to traditional banking facilities. Security and trust are fundamental to the success of e-payments, the one supporting the other. Given this we expect to see changes in two specific areas; customer authentication and the underlying infrastructure support for transactions. In the future we expect multi-factor authentication will become the norm for most online and offline transactions. This has already begun in the physical world think of EMV with chip and PIN which is now becoming a global payment standard. The online transaction community is likely to follow particularly in Europe where the European commission is keen to add some regulatory pressure. In addition it seems clear that authentication itself will likely become more secure as biometric technology from hand geometry, via face recognition and fingerprints to iris recognition become more mainstream. It sounds a bit Hollywood but in ten years time it will likely be old hat. On top of this, although unsexy and unheralded, the all-important underlying infrastructure that supports transactions is expected to also become more secure. Consider the replacement of magnetic stripes with chips and use of card number tokenization for NFC transactions as illustrations of this shift. Pay attention to two scenarios that demonstrate the dominance of social commerce. First, imagine Isabel, a 35-year-old professional. She opens her tablet. First stop is her homepage, from which she administers her universe. She has her favorite brands, her product wish list with the prices she’s prepared to pay (information she has shared with those same favorite brands) and an easy-to-manage dashboard defining what the outside world sees about her. Certain brands she trusts enough to share quite a lot about herself. These favorites, of course, know the most about Isabel, so that she can get exactly what she wants from them. Others aren’t as fortunate. They know only what Isabel wants to share with them — which isn’t much. If a brand is not on her list it won’t ever find out more, because she’s perfectly able and willing to control her digital information. In her digital life, she will “switch on” areas of interest and consider relevant offers. She will also block out the untargeted, low-value offers and emails she receives all the time. Isabel, you see, values control and monetizes her personal data by the way she manages it. Isabel is a segment of one. Optimizing the intersection of digital payments and big data is critical for merchants to serve the new powerful customer. Data has become multichannel, multi sector, multifaceted and for retailers being able to understand the behaviour of their customers not to mention their fragmented media existence will likely provide a whole new level of understanding and opportunity. Take for example the recent experience of a retailer interested in reaching last-minute holiday shoppers in (for argument’s sake) the luxury sector. By analyzing aggregated purchasing behaviour, with last-minute holiday spending, the company was able to conduct a better, more targeted campaign as a result. The reward was a 31.7% lift over the performance of a control group. Cross-border commerce is growing faster than domestic commerce and so will likely become increasingly important and influential. In fact, based on McKinsey’s research, cross-border flow of goods, services and finance could increase three folds from $26 trillion in 2012 to $85 trillion in 2025 representing a 10% average growth rate. Innovations in digital payments and technology such as payment cards, eBay, and AliPay will fuel this by simplifying cross-border commerce. Small businesses (SME’s) are likely to benefit significantly. Consider that 90% of commercial sellers on eBay are SMEs who export to other countries vs. less than 25% of traditional SMEs. Emerging economies are and will likely continue to be the main beneficiaries. China and India are the main drivers especially through trade with other emerging markets. Between 1990 and 2012 the share of trade of global goods between emerging markets quadrupled whereas between developed markets almost halved . Similarly, share of trade of global goods between emerging and developed markets increased 40% during the same period . Payment for transit by overseas travellers is one area of opportunity. Solutions like the one rolled out by London Underground that enables travelers to use their existing contactless bank cards (e.g., supporting MasterCard PayPass) without having to buy the local Oyster card are expected to continue to gain traction. Merchants are also expected to become smarter about engaging cross-border customers using transactional data. As an example, many types of merchants – including airlines, hotel chains and luxury fashion brands – have established relationships with travelers through loyalty programmes. Analyzing the spending patterns of frequently traveling members of the program can help identify the merchant types with which members engage most often. This may uncover new partnership and ancillary revenue opportunities. There will likely be several types of digital payments like payment cards, mobile money or digital wallets for different markets and applications. One area in payments that is likely to see significant transformation is low value payments (LVPs), everyday, high-frequency purchases for which cash is used (typically sub $10 transactions) and make-up the bulk of cash transactions today. Digitizing these will most likely require new payment solutions. It’s not simple. Any payment solution must create equitable value for all parties to a transaction. And value is a confluence of factors such as faster checkout, sales increase, information, safety, not just a function of pricing. Existing payment solutions are successful because they arbitrate a wide range of stakeholders to ensure equitable distribution of value. Digitizing low-value payments will likely require the same approach to create new payment constructs/business models. Merchants should invest in key capabilities to position for the future. The first is big data. They need to start developing a big data strategy and develop a roadmap for the next 10 years. Big data will give merchants the opportunity to serve the increasingly powerful customer and enhance the retail store experience in order to create a truly omnichannel experience. The good news is that merchants don’t need to depend on in-house capabilities; there are third parties that can help making big data a reality for merchants big or small. The second is POI and digital payments. Merchants need to assess the current usage of cash and develop a plan to reduce it. Perhaps the best way is to think about the end-to-end customer experience and assess what digital payments make business sense and how they may be integrated. There are more digital payments choices than ever before and they are only increasing, merchants are likely to find a solution that fits their needs. Third, think about global expansion. In this digital world of AliBaba and eBay and digital payments like payments cards and AliPay, becoming global is much easier for all merchants big or small. Online will be critical so invest in related capabilities. But go a step further, by thinking about it in the overall context of the omnichannel customer by focusing on a seamless experience across all channels. We will see significantly less cash over the next ten years. Use of technology and big data will be more prevalent and will not be limited to large merchants or some industries. Merchants will have to become more nimble and agile and continuously adapt their business as the environment has not been more dynamic before. Finally, new innovative players will continue to emerge across a range of functions including commerce, digital payments, big data and marketing; these will create both opportunities and threats for incumbent players.